"Tom thit rim" is one of the most popular dishes among Vietnamese dishes. 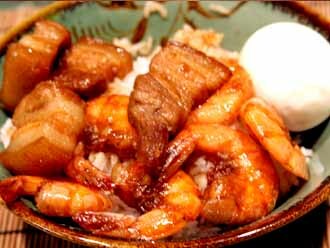 It's extremely tasty, for some reason the flavor of shrimp (with shell) blends wonderfully with the pork belly when simmered in the fish sauce caramel. Vietnamese kids grow up liking this, I grew up liking this dish so much. It's a fattening and not healthful if you eat this all the time, but once a while it's a delightly sinful dish to eat, especially during the Lunar new year celebrations where's it's a tradition to eat pork fat and high-cholesterol food. - Heat oil and sugar in a pot until hot. Insert pork and shrimps and stir frequently, reduce heat to medium. - When the shrimps turn red, pour in the shallot and garlic and continue stirring for another 2 minutes. - Add fish sauce, "Coco" soda, salt, pepper, reduce heat to low. - Cook for an hour or until the majority of the liquid is evaporated and the pork and the shrimps are caramelized. Eat with a bowl of rice (omit the egg, I added the egg because I had to eat it before it gets old).